Everything you need to start sewing right away! Comes with cool pre-cut patterns for quick and easy projects! 8 colors of embroidery floss, shapes to make felt animals and a notebook cover, stuffing, fabric, ric rac, needles, scissors, measuring tape, straight pins, thimble, pin cushion, buttons and a pom-pom strip. Carrying case measures 10&apos;W x 7&apos;H x 3.25&apos;D. Learn to sew. It&apos;s so easy!. With over thousands of new, unique products in inventory, UnbeatableSale.com is sure to have what you want today. 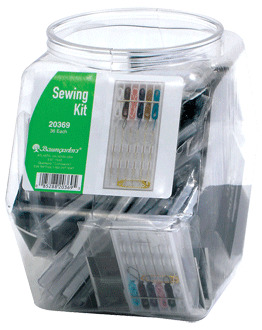 Order Alex By Panline Usa Inc. ALE195WN My First Sewing Kit with confidence thanks to our hassle-free return policy. Our everyday marked-down price is $29.76, $1.49 less than the retail price you'd pay at most stores. If you would like to track the status of your order, you may do so on our Order Status page using our ZIP code and order reference number. Don't forget to check out today's Unbeatable Deal for a great product at an unbelieveable price.